Most Doctors don’t get Facebook, Twitter, or Google+. This is to say that they have no idea how fast these venues that seemingly have no impact on day to day operations of a medical practice are about to have dramatic effects on the business of medicine. Recently, I had the opportunity to meet with a regional set of clinics that cater to patients needing same day care. That night, I decided to Google them for fun. Wow! They are easy to find online. Why? Because they’re everywhere in meaningful ways. No, I don’t mean physically with locations. I mean they have great reviews that show up on Google and push up their ranking. They have a Facebook page, they do online appointments, and even have a system to see patients via Skype. These offerings enable the practice to get the e-mail addresses of all of their patients and their patients want to disclose this information since the clinic is providing value in the exchange. Now the clinics can send reminders, vaccine updates, health advisories, and procure their image as thought leaders in healthcare to their patients. Shockingly, although I shouldn’t be so surprised, was that many of the patient reviews said things like “I’m leaving my primary care provider; why would I wait three weeks for my old doctor to see me?”, “The care is excellent, environment is nicer, and they even have fresh coffee and tea while I wait and use the free wi-fi”. Do you think this group may offer some competition to the old PCP model or Urgent Care clinics that charge significantly more? So how does this apply to Facebook and how does that relate to you as a physician or other healthcare provider? There are many ways to use Facebook professionally and some may go out of the scope of this article. You already know that patients are looking for you on Google, but did you know that they may also be searching for you on Facebook? That’s right, Facebook as a search engine. It doesn’t appear that Mr. Zuckerberg is trying to replace Google but he has made it clear that Facebook will continue to grow in search capability. In the box at the top, you can search. Here is what happens when I search for “Portland Doctor”. Where would you like to be on the list for your city? If you’d at least like to be on the list, you’ll need a Facebook business page. If you want to rank high on the list, you’ll need to optimize your page. A few things to remember include that Facebook loves pictures and video. Most important is simply filling out your About page so that the correct info is there. The last thing you want is an incorrect listing and by doing the basics, you also minimize the risk that your patients will find duplicate pages. It is unfortunately common to find what I’ll call “ghost” pages on your practice or business. Nobody knows who created them and nobody ever posted or did anything with them. You can get rid of these, but it’s a bit of a nuisance and involves contacting Facebook support. Personally, I leave them alone or try to claim them so that I can manage them or even re-purpose the page for enhanced marketing. 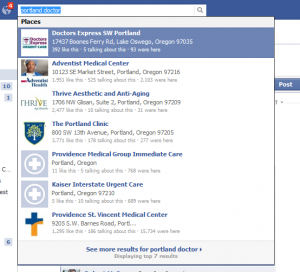 Patients trust doctors that they feel they can communicate with on Facebook. 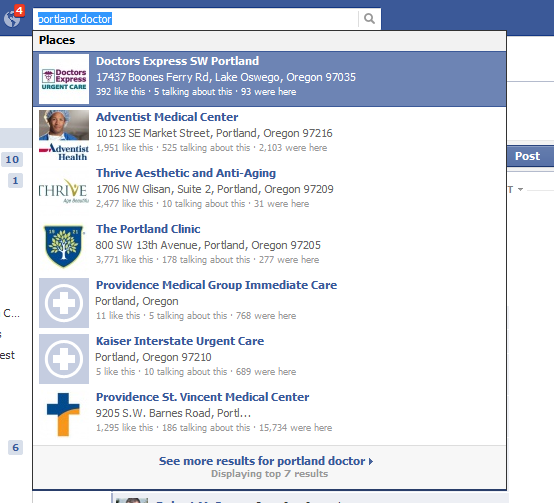 The next step in Facebook marketing for a medical practice is to decide who may post, who will monitor for posts, and how you will go about managing any negative comments from upset patients. None of this is really that difficult but enough could be said to warrant another article. How Doctors communicate with patients online and boundaries are a topic of debate. The Golden Rule: Remember HIPAA applies online too! Don’t discuss medical conditions or any of the patient identifiers. Facebook is a marketing tool and a huge opportunity to develop professional relationships with patients, other Doctors, and other clinics that may be excellent sources of referrals. Think of who you want to “like” your page. Share what may be relevant to them. Offer content that will be useful such as photos of your practice, patient referral forms, info on current medical emergencies, research from WebMD that relates to the conditions you treat, videos of you or your physicians discussing important ways to prepare for a procedure. The ways to harness Facebook are a bit limited by HIPAA and general common sense, but overall it is only your imagination that draws the lines. I’m sure there is much to add, so please comment below on positive ideas you have for using Facebook in a medical setting.